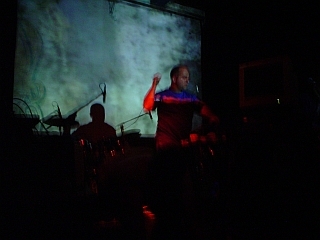 Stills from the second performance of Son of Science, the first with the full ensemble, supporting Damo Suzuki, Revolver, Melbourne, 27 Feb. 2004. Each performance features the video piece, Rot Emulsion, originally produced for Tat Fat Size Temple, by Andrew Thomas (Secession’s in-house designer) and myself. 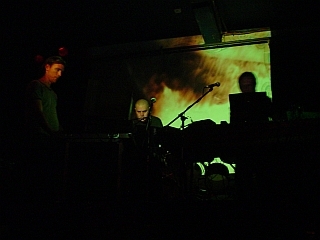 John Power, Steve Law and I performing “Citidal”. John’s video/game-sound engine projected at the rear. 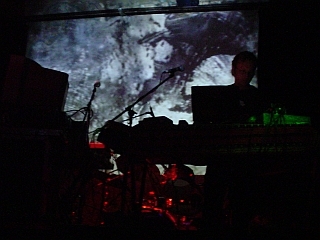 It was liberatting for us all to have John not only project visuals, but add sound to the mix simultaneously. 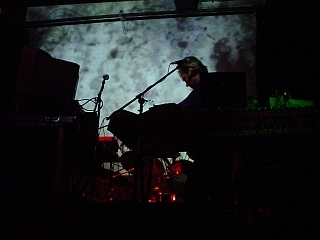 Steve and I provided sounds which were triggered via a range of actions within the unique space, or room, John had created. 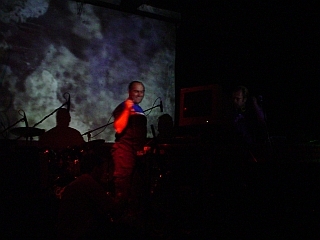 Mark Tallon singing “Border Song”. Originally wrote this piece for the spoken word opera, Auslaender und Staatenlose. 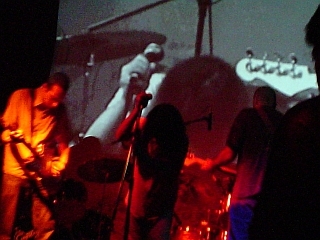 Mark sang for the infamous Sydney band, No More Bandicoots, some 20 years ago! 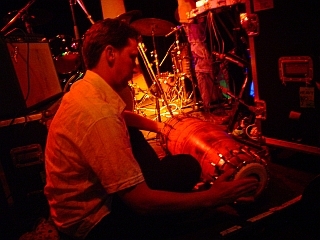 David Forbes playing tabla on “Border Song”. David’s been playing since 1984 and has performed to thousands of devotees at ashrams throughout India. 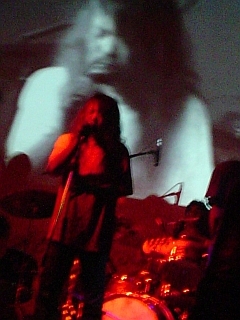 Damo Suzuki in full flight… The first of his three sets was by far the most sensational performance I’d seen since Asia Dub Foundation toured around 3 or so years ago. I meet Damo but all too briefly. He resonates a deep spiritual persona that is further amplified when on stage. Amazing to think that it was only August of 2003 that I was re-united with the legacy of CAN, inspiring much of this new body of work and in less than 6 months I’m supporting Damo… Warren (Brains) suggested I’d summoned him to Australia!